Banteay Samré (Khmer: ប្រាសាទបន្ទាយសំរែ) is a temple at Angkor, Cambodia located east of the East Baray. Built under Suryavarman II and Yasovarman II in the early 12th century, it is a Hindu temple in the Angkor Wat style. 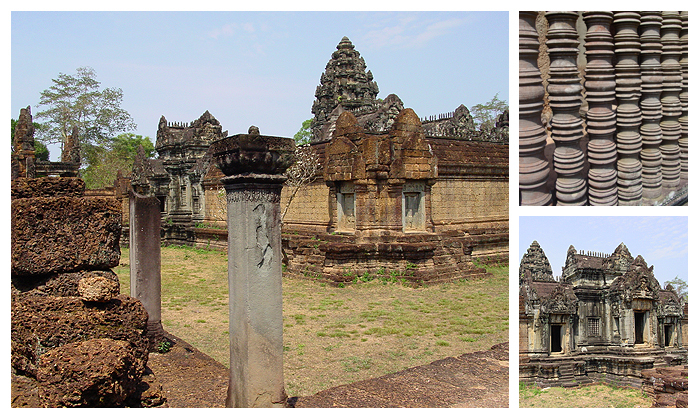 Named after the Samré, an ancient people of Indochina, the temple uses the same materials as the Banteay Srei. Large, comparatively flat temple displaying distinctively Angkor Wat-style architecture and artistry. The temple underwent extensive restoration this century by archaeologists using the anastylosis method. Banteay Samre was constructed around the same time as Angkor Wat. 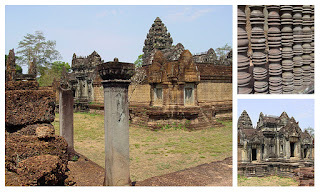 The style of the towers and balustrades bear strong resemblance to the towers of Angkor Wat and even more so to Khmer temple of Phimai in Thailand. Many of the carvings are in excellent condition. Banteay Samre is a bit off the Grand Circuit, near the southeast corner of the East Baray. The trip there is a nice little 3km road excursion through villages and paddies. Combine a visit to Banteay Srey with a stop at Banteay Samre on the way back.